The past few weeks I have been talking about making progress even if it is in little steps. Eventually, all those little steps result in a completed project. I did manage to finish this little basket yesterday. I worked on it for about 4 days, doing a bit here and there as time permitted. As you can see, it is small, that is a 6 inch ruler standing in it. I used a free pattern from Just Be Crafty. The cotton yarn is the same as I have been using for the hand towels and the hot pad. I still have lots remaining, so next up is a slightly shorter version of this basket. I'd like to try using the same pattern and instead of worsted weight yarn, use 2 inch wide strips of fabric and a much larger needle. I'd like a basket to hold my current knitting/crochet project. Have you tried a knit or crochet project with fabric strips, any suggestions? Progress continues with the buttons. In this photo, I believe I have 115 red buttons sewn down. The spaces are starting to fill in nicely. Since I want to keep track of the number of buttons I use, I had to develop a process that would work. I tried ticking off each button as I sewed it on. Nope, I was starting to miss buttons or double count others. Next I counted out 25 buttons and added them to the list, then sewed them on. That worked perfect, so that is the approach I am using. I have the selected buttons laid out on my sewing table. 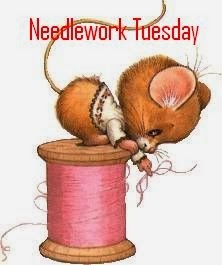 Then I thread the needle and tie off the ends. Sew on a button, pull the needle up to the next spot, loop through the fabric a few times to secure, then sew the next button. I use a long length of thread and can sew on about 6-8 buttons before re-threading. When I get tired or need a break, I just leave the project on the table and walk away. It's all ready for the next little bit of time I have. So, even it I just have time to sew on 2 or 3 buttons, I am making progress. When I am out, I keep looking for more red buttons, I want a few more character/shape buttons. I have a few flowers and some with rhinestones, but would like an animal or two and a little car. Have seen these before, but not in red. I'm sure I'll come across them at some point and will then add them in. You might think that it would be tedious sewing on all those buttons, but I am finding it to be rather methodical and almost meditative. Up and down each hole three times, then across the back, up again, loop to secure and start again. With the placement of each button, I can envision the finished project just a little bit closer. It might also help, that sometimes, I listen to an audio book while stitching. I hope that you have been making little bits of progress on your stitching this past week. I've only seen a those baskets made with fabric strips online, but I like the idea and the look of them. Good luck with yours. Your button maple leaf is looking awesome! I've always wanted to do a button project (God knows I have enough of them...none of them red, sorry)...maybe this will get me started. Thanks for the inspiration.